every single night for the past, um ... eight months, i've ended the day with the aid of a headlamp hanging off the side of our bed. i guess we* were uncertain as to where the bed would be living in the room? or lazy? or both? whatever it was our level of commitment to putting things like lights in that room was non-existent. until last week. something happened last week. something good. our shithole turned into a HOUSE. you shouldn't get too excited or anything, i've still got a ton of work to do, but for the first time since we've moved in i honestly feel as though i could invite people over. not a whole lot of them, and not anyone i don't really know, but still this is huge step for me. for the past eight months mas has been asking if we should maybe have so and so over for drinks before dinner. or perhaps over for dinner? and i've either laughed at or nearly scolded him every single time. i've always been so obsessive about what our home looks like that i just could not take it, having someone see all of the boxes and mess and lack of seating options. it makes me crazy just thinking about it now. i know, i know, i'm nuts. *when i say we here i mean mas. having not been around for the initial set up of the bed he's convinced it will be better on another wall. he of course, is wrong. Where'd you get those lights? I love them! Also I think the gray walls are very pretty. 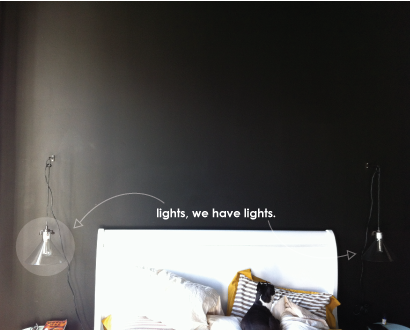 We still have an industrial lamp (note - *not* chosen for aesthetic purposes) in our bedroom. Somehow need to find just the right lamp to take its place. P.S. - Have people over for dinner! It will be less scary once you get the first one over with. Realistically, the house is probably always going to be a work in progress on some level, right? You are a project-y person, lady. oh man, having people over is such a process, isn't it? don't ask me why i felt the need to buy a new duvet and lamp shade for the dining room before joe's brother came to visit, but i did. I'm even more honored to have been invited over for burgers now! And I'm inviting myself over again to see more progress. Plaid wall?